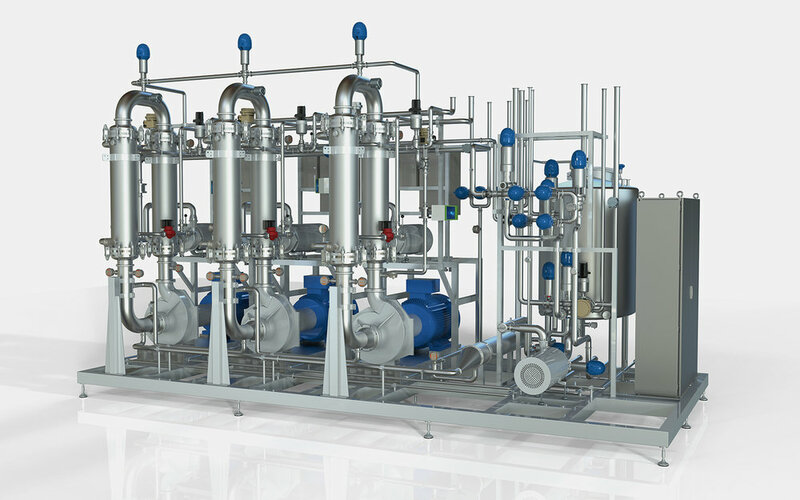 MT Separation is a Norwegian niche company designing fluid separation systems for all industries; offshore and onshore drilling, pharmaceutical, marine, process and dairy industry. A dedicated team driven by solid experience, innovative expertise & diversity. In recent years MT has developed and supplied several systems to the oil industry for use in onshore and offshore applications. MT complies with offshore quality according to Norsok standards like Ex Zone 2 with ATEX certification. MT delivers membrane units on skid framework, but also in containers for out house installation and mobil transport. All units are delivered complete tested and ready for operation. The picture shows units in sanitary 316 piping which is our standard design. MT has delivered several MF and UF systems using ceramic membranes, for instance to the dairy industry for separation of milk and to the fish meal industry for concentration of protein material. Some units are delivered with diafiltration sections for purification and nanofiltration units for desalination. The systems are delivered in dairy standard or pharmaceutical quality as required. MT delivers RO systems for low conductivity water production in the process industry and chemical industry with capacities typically 60 m3/h or higher. MT has supplied NF systems for a variety of applications like desalination of whey, diafiltration of contrast media and reuse of acids. Our standard systems comply with dairy standards, but we also build systems with higher grade stainless steel qualities for more demanding applications, for instance pharmaceutical quality with orbital welding and RA values below 0,5 micron. MT has delivered several systems for pharmaceutical and chemical industry. For these applications quality control on material and stainless steel work is of outmost importance. Standard solution is 3.1 material certificates on all material in contact with product together with full traceability on welds and welder. In case with flammable solvents we deliver Ex systems for zone 1 or 2.